A skin biopsy is performed in order to send a sample of skin to the pathologists to verify a diagnosis. Biopsies of the skin are usually performed straight away during your consultation. After examining the rash or a lesion that you or the dermatologist finds concerning, you will be asked questions regarding its history. We will then determine whether a skin biopsy is necessary. In the case of a rash, a fresh, but well-developed, lesion will be chosen. We will do our best to avoid biopsies in cosmetically sensitive sites although this is not always possible. In the case of a potential skin malignancy, a total body skin examination will be carried out and the most worrisome lesion(s) will be biopsied. The biopsy area is cleansed, usually with chlorhexidine, and then a local anaesthetic such as lidocaine is injected to numb the area, using a very fine needle. The lidocaine solution often contains epinephrine (to decrease bleeding) and you should alert us whether you have experienced any prior adverse reactions to local anaesthetics. When the local anaesthetic is carried out, you will feel a slight pinch of the needle, and then a brief burning sensation as the anaesthetic is injected. A feeling of pressure may also occur when the local anaesthesia is injected into a relatively taut area of skin such as the fingers or toes. If you are apprehensive regarding the injection, a topical anaesthetic can be applied 30 minutes prior to the procedure to reduce the associated pain. Once the area is numb, the punch biopsy will be carried out. 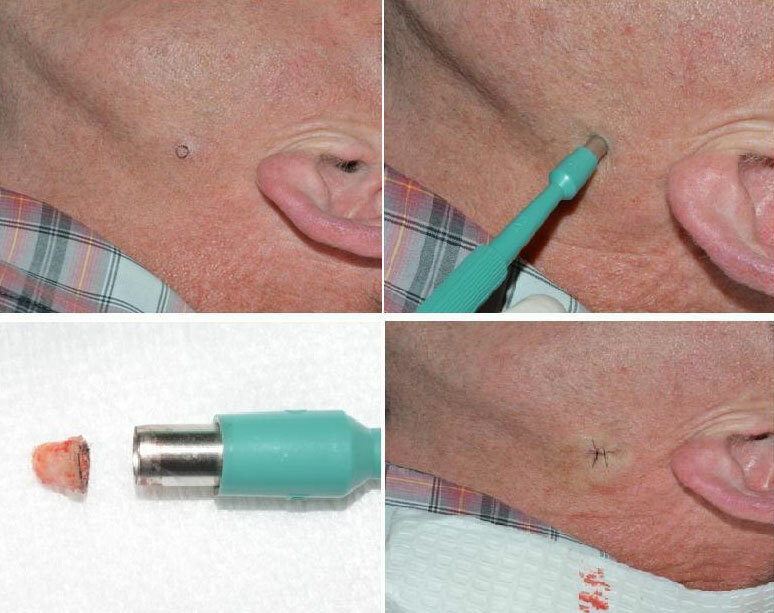 A punch biopsy involves the use of a circular blade which looks like a cookie cutter to remove a small section of the skin (usually between 2-4mm in diameter) including the deeper layers of the skin (down to the fat). It enters the skin with a gentle turning motion and sutures or stitches will then be used to close the small wound. Most patients do not have a great deal of pain after the procedure. If you experience tenderness, paracetamol should be sufficient to provide relief. We will provide you with detailed post-procedure care instructions.